Rather than fix what's broken with the real economy, ZIRP/NIRP has added problems that only collapse can solve. The fundamental premise of global central bank policy is simple: whatever's broken in the economy can be fixed with zero interest rates (ZIRP). And the linear extension of this premise is equally simple: if ZIRP hasn't fixed what's broken, then negative interest rates (NIRP) will. Unfortunately, this simplistic policy has run aground on the shoals of reality: if zero or negative interest rates actually fixed what's broken in the economy, we'd all be living in Paradise after seven years of zero interest rates. Crush depth, officially called collapse depth, is the submerged depth at which a submarine's hull will collapse due to pressure. This is normally calculated; however, it is not always accurate. 1. Zero interest rates force investors and money managers to chase yield, i.e. seek a positive return on their capital. In a world dominated by central bank ZIRP/NIRP, this requires taking on higher risk, as higher yields are a direct consequence of higher risk. The problem is that the risk and the higher yield are asymmetric: to earn a 4% return, investors could be taking on risks an order of magnitude higher than the yield. 2. To generate fees in a ZIRP/NIRP world, lenders must loan vast sums to marginal borrowers--borrowers who would not qualify for loans in more prudent times. This forces lenders to either forego income from lending or take on enormous risks in lending to marginal borrowers. 3. The income once earned by conventional savers has been completely destroyed by ZIRP/NIRP, depriving the economy of a key income stream. 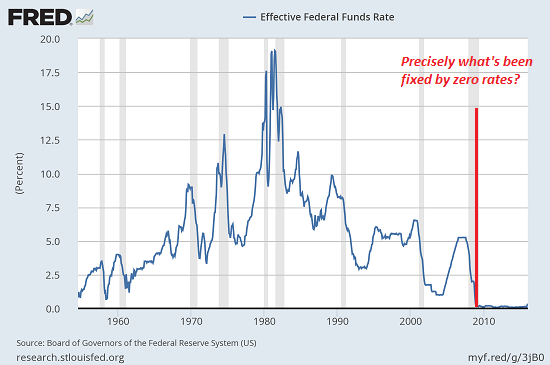 The reality is that zero interest rates have only brought debt-based consumption forward, expanded lending to marginal/high-risk borrowers and forced capital into dark caverns of risk from which there is no orderly escape. 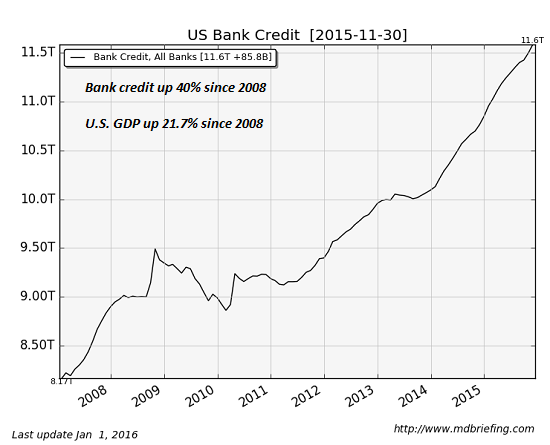 What's the crush depth of all this impaired debt and risky credit? Nobody knows. Rather than fix what's broken with the real economy, ZIRP/NIRP has added problems that only collapse can solve. If zero or negative interest rates actually fixed what's broken in the economy, we'd all be in Paradise now. Instead, we're in a sinking submarine awaiting the implosion of predatory excesses. In other words, a financial Hell.